Gas appliance maintenance is always the customer’s responsibility, but we're here to explain how you can keep your appliances operating safely and efficiently. Have your gas appliances inspected regularly by a qualified professional. Never store rags, mops, paper, or other combustibles near any gas appliance. Never store anything near a gas appliance that might interfere with normal appliance airflow. Make sure that your gas fired appliances have plenty of air so they can work properly. Never store or use flammable products in the same room or near any gas or heat-producing appliances. Such flammable products include gasoline, spray paints, solvents, insecticide, adhesives, insect foggers, varnish, cleaning products, and other pressurized containers. Monitor you water heater temperature. Hot water can scald! Before our technicians check or re-light your water heater, they are trained to return your hot water setting to a safe temperature. However, it is wise to re-check this setting after the heater has been serviced. Check outdoor appliance exhausts year round. If the vent becomes blocked, an emergency switch should stop the furnace from running. Snow or ice can build up and block the opening, and even bird nests and "stink bugs" have been cited as the cause for some furnace vent problems. Never cover openings with mesh or netting, as this may affect proper operation. To help keep your gas appliances operating safely and efficiently, a qualified professional should inspect your gas appliances and venting systems at least every year, or as often as the manufacturer recommends. Not performing regular maintenance may result in inefficient appliance operation, and in some cases, dangerous exposure to carbon monoxide. Don’t Let Water Pipes Freeze! Frozen water pipes can cause hundreds (if not thousands) of dollars’ worth of damage, resulting from burst plumbing or damaged walls, ceilings, and floors. Before colder temperatures take hold, take time to make sure your water pipes do not freeze during the winter. Locate pipes that are most susceptible to freezing—those near outer walls, in crawl spaces, or in attics. Both copper and plastic water pipes can burst. If pipes are close to an exposed outside wall, wrap pipes with pipe insulation or layers of newspaper with plastic to keep out moisture. As cold weather sets in, you can open any attic, closet, or cabinet door to let room heat in. It only takes a day or two of sub-freezing temperatures to cause damage. If you plan to be away from home for a period of time, consider “winterizing” your pipes (turning off the main water valve and opening all faucets to drain the system), even if you have someone looking in on your home while you’re gone. Be aware that leaks sometimes don’t show up until a pipe thaws, which can cause extensive damage to walls. If you own a rental property (vacant or occupied), check frequently to be sure the building is adequately heated or, in the case of a vacant property, consider winterizing the building as above. If your water pipes do freeze, call a professional to thaw them. NEVER use a torch. Avoid lint build-up by vacuuming the floor furnace and the area around it regularly. Avoid fires—don't place rugs, furniture, or combustible items over or near the grill, and do not block the airflow. Clean inside the burner compartment of a built-in, vented wall furnace once a month during the heating season to prevent lint build-up, or in accordance with the manufacturer’s instructions. Never place combustible items on or near the appliance or vent. Keep furnace heat registers free of obstructions. Don't store items nearby that might stop or restrict airflow. 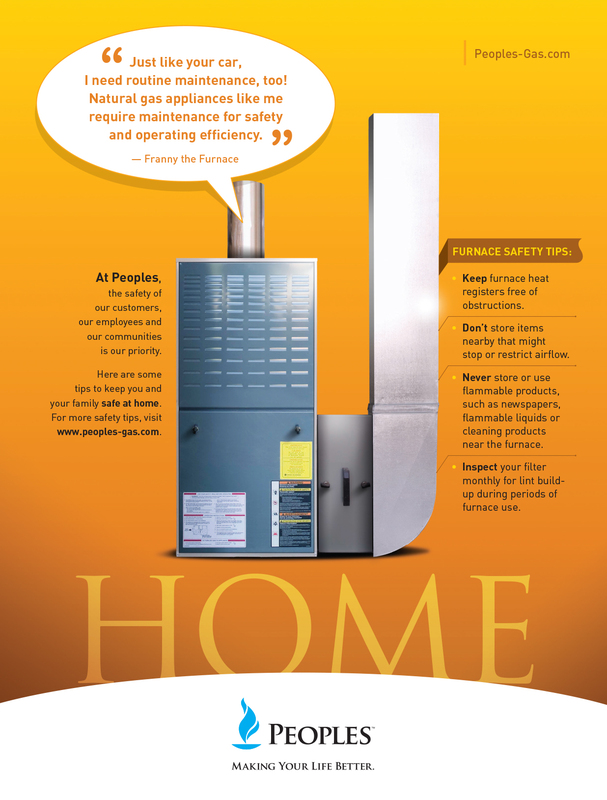 Many gas furnaces use air from the indoors to operate. Lint, dust, and pet hair carried by air, or items stored in or around the furnace can block or restrict airflow. In order to operate safely and efficiently, your gas furnace must be kept free of dust and lint build-up and other obstructions stored near the furnace. Never store or use flammable products, such as newspapers, flammable liquids or cleaning products near the furnace. Most forced-air furnaces have a filter that cleans the air before heating and circulating it throughout the home. Inspect your filter monthly for lint build-up during periods of furnace use. Clean or replace the filter if necessary. Replacing filters often can improve appliance efficiency and reduce your energy consumption. When installing a new or cleaned filter, be sure to re-install the front panel door of the furnace properly so it fits snugly. Never operate the furnace without the front-panel door properly in place because doing so may create the risk of carbon monoxide poisoning. Most new forced-air furnaces have a safety (interlock) switch that prevents furnace operation when the filter compartment door/panel is not in place. However, some older forced-air furnaces do not have a safety switch and can be operated with the filter compartment door or panel off or not properly in place. Always install and use unvented space heaters in accordance with the manufacturer’s instructions. Unvented space heaters are not to be used as the sole source of heat in your home. *Note: Manufacturers’ labels and/or instruction manuals for new Flammable Vapor Ignition Resistant (FVIR) tank water heaters may or may not indicate the 18-inch elevation requirement for garage installations. Always follow the manufacturer’s recommendations. Never store or use flammable products such as gasoline, paint thinner, cleaning products, etc. near or in the same room as any gas or heat-producing appliance. Lowering your temperature setting can prevent scalding accidents and lower your energy costs. Water temperatures above 125° F can cause severe burns or even death. Households with small children, or disabled or elderly persons may require a lower thermostat setting to prevent contact with "HOT" water. Please refer to your water heater manufacturer's recommendations for safe water heater temperature settings. All gas dryers are required to be vented to the outdoors. Do not exhaust gas dryers into an attic, chimney, wall, ceiling, or concealed space of a building. Use only approved metal vent ducting material. Plastic, vinyl and foil accordion style materials are not approved for gas dryers. Inspect the exhaust duct regularly to ensure that it has not become crushed, kinked or otherwise restricted. Keep area around the exhaust opening and adjacent surrounding areas free from accumulation of lint. Periodically clear the interior of the exhaust duct. This work should be performed by a licensed, qualified professional. Keep range top area clean of grease. Grease is flammable and excessive build-up may result in a fire. Do not use the range top or stove to heat the home. Do not install items such as aluminum foil in the oven or range top to avoid restricting exhaust vents which may result in carbon monoxide poisoning. To help avoid serious accidents, the damper must be kept open on a permanent basis. Use the damper lock included with the gas log assembly kit. Vented gas logs can only be installed in an existing masonry fireplace. You may not be required to install ventless gas logs in an existing masonry fireplace. Always follow the manufacturer's installation instructions and be sure the logs are placed exactly as recommended. Not following the manufacturer’s instructions may result in carbon monoxide. Always ensure gas appliances are installed in an area with sufficient air for combustion as outlined in the International Fuel Gas Code or per local code requirements. Although natural gas meters are relatively weatherproof and require little maintenance, please follow the safety tips listed below to help keep you, your family, and others safe. Never tie (tether) pets to gas meters, and never use gas meters to hang garden hoses or other tools. Plants, shrubs, snow, and debris can block the dial face or pathway to the meter, preventing access for our meter readers. Keeping a clear path to your gas meter not only helps Peoples employees to perform routine maintenance, but also allows emergency responders quick access should the need arise. In the winter, snow and ice can accumulate on a meter, which may affect operation. Remove snow and ice from your natural gas meter with a broom or brush, but never kick or try to chip with a hard object. Look up! Gutters and overhangs can accumulate ice, which could melt during the day and splash up into regulator vents then freeze again at night, which may lead to improper pressures. Ice could also break off and damage a meter, if struck. Keep meters at least 3 feet away from ignition sources and from appliance vents or intakes. Appliance flue products contain moisture, which could freeze in cold weather and which is also corrosive. Never hang a light bulb near a meter for heat. Gas meters with regulators require open air around them, so never box in or wrap your meter with blankets. The U.S. Consumer Product Safety Commission (CPSC) periodically announces safety recall programs for certain gas appliances and equipment. Information about product recalls that may affect your appliances is available at the CPSC website or by calling the CPSC at 1-800-638-2772. Many appliances installed in mobile homes or manufactured housing are designed specifically for those types of homes, so some standard gas appliances may not be suitable in those cases. Gas appliances require a minimum of 50 cubic feet of space per 1,000 BTUs of all appliances located in that space.